Dubai: The fans who turned up at Khalifa Bin Zayed Stadium in Al Ain for Tuesday evening’s crucial Group B clash between Australia and Syria were treated to a feast of fine and sometime frenetic football in the Garden City. The defending champions were ahead twice and looked to be cruising comfortably to their second win of the tournament but twice, their tenacious opponents fought back to leave big question marks over the Socceroos’ credentials as one of the favourites for the competition. Only a 93rd-minute winner from Tom Rogic salvaged a 3-2 win to leave Syria heart-broken. Jordan’s 0-0 draw with Palestine in the other game of the group meant that Australia progress along with group winners Jordan, but Arnold’s men will need to find another gear — and fast — if they want to take the trophy back to Australia. Socceroos coach Graham Arnold had warned that Syria would be no pushovers, and so it proved in the opening period as the minnows took the game to the Socceroos and were almost ahead after 18 minutes when Omar Al Somah was clean through, only to lose his footing with Mat Ryan’s goal at his mercy. 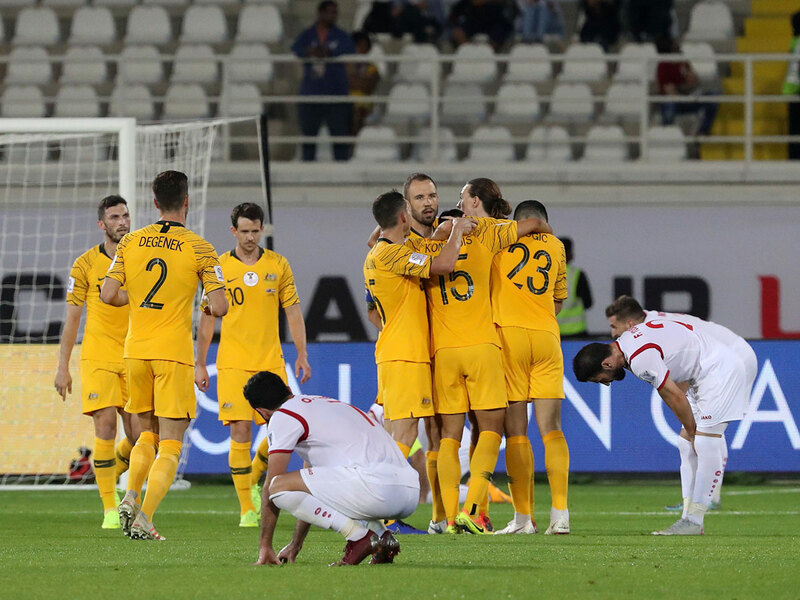 Australia did not heed the warning signs and Syria were celebrating when a free-kick bounced into the top corner of Ryan’s net, only to be ruled out for a foul in a congested area by Mohammad Osman on Aussie captain Mark Milligan. Finally, Australia were waking up, and it took a great double stop from Syria No. 1 Ebrahim Alma to keep out youngster Jamie Maclaren 10 minutes before the break. The final five minutes of the half had the crowd on their feet as Australia’s belated pressure finally told and Awer Mabil opened the scoring with a well-taken curling effort from outside the area. Syria refused to lie down and were level in a matter of moments as Omar Khribin got his head to a fine cross following a poor clearance from Ryan. Although the keeper got a hand to that effort the Syrian star followed up with his foot to ensure parity at the break. Australia came out looking more like the defending champions rather than the side that were stunned 1-0 by Jordan in their opening game. Mabil fired just over before Maclaren chased after a loose ball with only the keeper to beat, but Alma was off his line quickly to clear the danger. The Socceroos restored their advantage on 54 minute when a brilliant ball in by Rogic beat the defensive line and Chris Ikonomidis was on hand at the back post to slot home. Despite the best efforts of Omar Al Midani to clear, the ball was adjudged to have crossed the line and Mexican referee Cesar Ramos signalled the goal. Syria were screaming for a penalty when Milligan played the ball onto his own arm inside the Australia area and it was a big mistake from referee Ramos and his assistants as they all missed the infringement. Maclaren should have had Australia’s third on 65 minutes, but he shot tamely at Alma when he had plenty of time to pick his spot. Australia looked for a killer goal, with Rogic and Maclaren both going close and the woodwork coming to Alma’s rescue on 73 minutes. Ryan still had to be alert to halt a rare second-half Syria foray with 15 minutes remaining but he was soon picking the ball out of his net as Milos Degenek fouled Al Somah in the penalty area as the Australia defence attempted to deal with a cross and Al Somah made no mistake from the spot, sending the keeper the wrong way. Syria substitute Fahd Yousef was off target with an optimistic volley from distance as Fajr Ebrahim’s men grew in confidence that they would get something from the match. But they only got heartbreak as Rogic cracked home from distance to secure a questionable victory.